Frugal Fitness: Frugal Sports Medicine: Fight Shin Splints! Frugal Sports Medicine: Fight Shin Splints! Shin splints can be a big problem for runners and many other athletes. They don't usually lead to severe injury or complication, but they can become a chronic nuisance and performance detractor if ignored. They can certainly be a death sentence to a distance runner's career. One way to reduce the risk of getting shin splints, or of minimizing symptoms, is to strengthen and stretch the major muscles of the lower leg: gastrocnemius, soleus, and tibialis anterior (yes there are other smaller muscles of the feet and lower leg that also can be worked). This can help to provide extra support for the shin bone (tibia) and minimize some of the impact of running and other high stress activities (plyometrics, step class, sports) on that bone. It could also help to reduce inflammation. 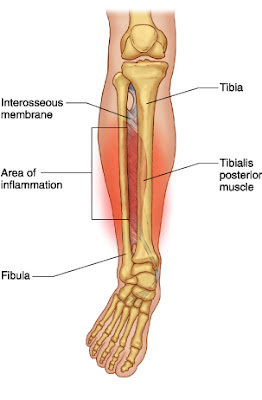 Strengthening the tibialis anterior, as shown in the video below with the standing calf raises rocking back on your heels, may be the most helpful. Check this workout out for yourself to build calf muscle, strength, explosiveness, endurance, and possible injury prevention / rehabilitation.